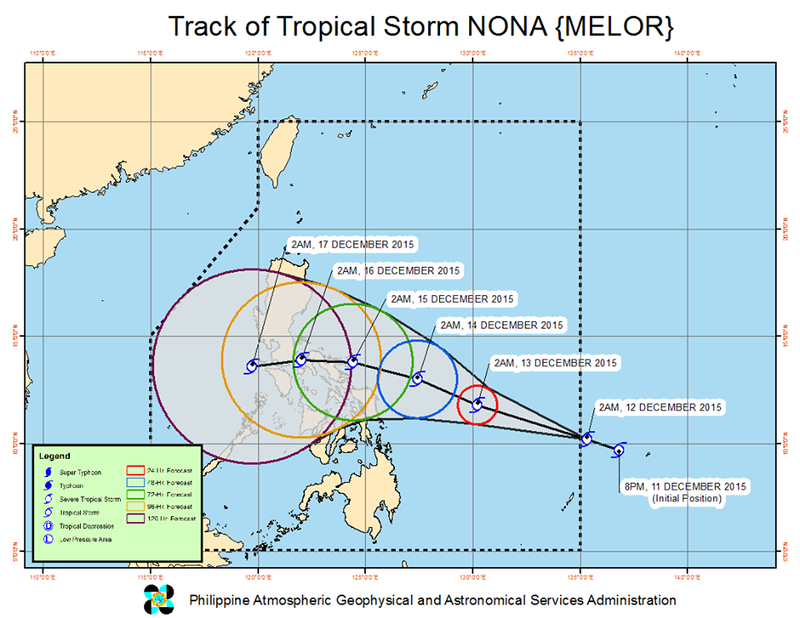 MANILA, Philippines - State weather bureau PAGASA announced today, December 12, 2015 that tropical storm 'Nona' (international name: Melor) has entered the Philippine Area of Responsibility (PAR) early Saturday. At 4:00 am, the center of Tropical Storm (Bagyong) 'Nona' was estimated based on all available data at 1,110 km East of Maasin, Southern Leyte (10.2°N, 135.0°E). TS Nona has maximum sustained winds of 65kph near the center and gustiness of up to 80kph. It is forecast to move West Northwest at 25kph. Estimated rainfall amount is from moderate to heavy within the 100 km diameter of the Tropical Storm. PAGASA forecaster Gener Quitlong said that 'Nona' may make landfall over Samar or Bicol region on Monday and Tuesday. “There’s a possibility of it becoming a typhoon. But we don’t see it becoming a supertyphoon,” he said. 24 hour (Tomorrow morning): 580 km East of Catbalogan City, Samar. 48 hour (Monday morning): 370 km East of Sorsogon City, Sorsogon. 72 hour (Tuesday morning): Vicinity of Virac Catanduanes. 96 hour (Wednesday morning): 250 km West of Virac Catanduanes. 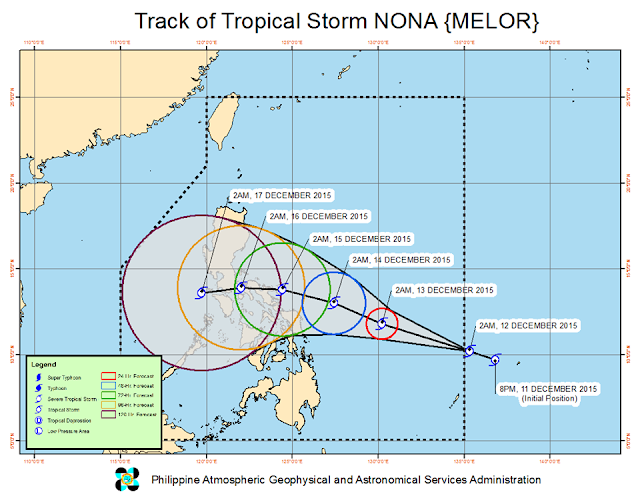 Nona, originally named as 'Nonoy' is the 14th typhoon to hit the country this 2015. It was formed out of a low pressure area that formed over the Marianas Islands early last week. On average, there are around 19 to 21 typhoons in the country every year. According to PAGASA forecaster Shelly Ignacio, they changed the typhoon name from 'Nonoy' to 'Nona' as a respect to the highest official of the country, President Benigno 'Noynoy' Aquino III. By Sunday (December 13) , Eastern Visayas will have cloudy skies with light to moderate rains and isolated thunderstorms. Cloudy skies with light rains will prevail over Northern Luzon while the rest of Luzon will have partly cloudy to cloudy skies with isolated light rains. The rest of the country will be partly cloudy to cloudy skies with isolated rainshowers or thunderstorms. By Monday (December 14) , Bicol region, Eastern and Central Visayas will have cloudy skies with light to moderate rains and isolated thunderstorms. The regions of Ilocos and Cordillera will be cloudy with light rains. The rest of the country will be partly cloudy to cloudy with isolated rainshowers or thunderstorms. By Tuesday (December 15) , stormy weather will be experienced over Eastern Visayas, Bicol Region, CALABARZON and the provinces of Marinduque, Romblon and Metro Manila. Central Luzon, Central and Western Visayas and the provinces of Mindoro and Palawan will have cloudy skies with light to moderate rains and isolated thunderstorms. The rest of the country will be partly cloudy to cloudy with isolated rainshowers or thunderstorms. By Wednesday (December 16) , Metro Manila, MIMAROPA and the provinces of Zambales and Bataan will have stormy weather. Cloudy skies with light to moderate rains and isolated thunderstorms will be experienced over the rest of Luzon. The rest of the country will be partly cloudy to cloudy with isolated rainshowers or thunderstorms. By Thursday and Friday (December 17-18), Metro Manila, Bicol region, CALABARZON, Central Luzon and MIMAROPA will have cloudy skies with light to moderate rains and isolated thunderstorms. The rest of Luzon will have partly cloudy to cloudy skies with isolated light rains. Visayas and Mindanao will be partly cloudy to cloudy with isolated rainshowers or thunderstorms.